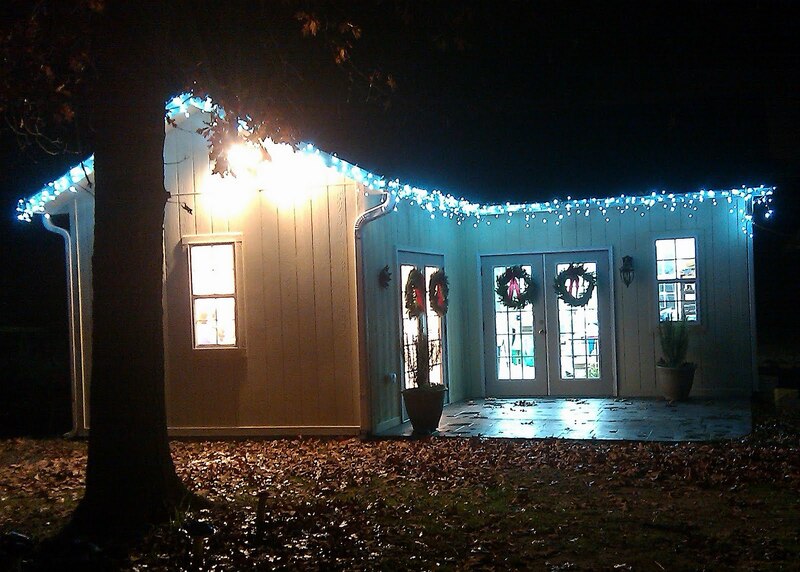 THE Second Annual Saxapahaw Holiday Open House Tour!!! Home » Blog » THE Second Annual Saxapahaw Holiday Open House Tour!!! Posted by cindy on Dec 9, 2010 in Blog | Comments Off on THE Second Annual Saxapahaw Holiday Open House Tour!!! I’ve been so busy making art (for the Tour and Christmas commissions), I am late in posting this! This weekend, on December 11 and 12, local artists and business people of Saxapahaw are hosting a Holiday Open House Tour. (Saxapahaw is a small village located about 20 minutes west of Carrboro and between Burlington and Pittsboro.) There’ll be lots of holiday cheer, art, performances, even a tree lighting. Here at Out of the Fire we’ll have free mini classes where you’ll get to play with clay and I can offer some instruction. Not as intense as our regular classes, since I’ll have to circulate a bit, but you’ll get to see if you like working with clay (I haven’t met many people who don’t), and make something wonderful. I will fire it and get in touch with you so you can pick it up. I’ll even try to have it ready in time for the holidays. We’ll also have refreshments for you to enjoy while you look at art in the studio and the gallery. From one-of-a-kind sculptures (large and small) to ornaments to adorn your tree. I have to confess, I had to swipe a few to put on mine! And, there is some garden art outside–mushrooms and toad houses, sun faces and Garden Spirits. This winter we’ll have classes at the studio, and if you sign up now, you’ll get a 10% discount! If you can’t make it this weekend, don’t fret–just give me a call at (336) 376-9091 and we’ll set up a time for you to come for your own private tour. I’m here almost all of the time, but it’s best to call ahead. Out of the Fire is on Church Road, just 3 doors down from Rt. 87, 10 miles south of the intersection of Rt. 87 and I-40. You can also get here from the Mill area, our “downtown,” and from Old Greensboro Highway. The studio is spruced up and ready for the holidays. Here is the rundown of all of the people participating. For updates, more information and a map see our very fun interactive web site, designed by Steve Durland: www.saxapahaw.com. The Hawbridge School, a tuition-free public charter school, grades 6-12, will host an Open House for prospective students and their families as well as a Hawbridge Designs sale of student-designed silk scarves colored with locally grown natural dyes. Proceeds from the sale support the school’s art department and its programs. Sunday, Dec. 12, 1-6pm, 1735 Saxapahaw-Bethlehem Church Road. 336.376.1122 or www.hawbridgeschool.org. Out of the Fire Sculpture Studio – Kiln opening and open studio with free mini-classes and discounts for early enrollment in winter classes. Refreshments and light fare. Dec. 11 and 12 from 12 noon to 6 p.m.6035 Church Road. 336-376-9091. Email: cbiles@triad.rr.com. Face book: Out of the Fire Clay Sculpture by Cindy Biles. Paperhand Puppet Intervention is offering shows of Love and Robots Dec.10, 11 and 12 at 2 p.m. and 7:30p.m. at the Community Center.Tickets and more info are available @ www.paperhand.org. Roxy Farm Antiques – Antiques and art show by Louis St. Louis. Join us for some Yuletide cheer with locally grown wines from Benjamin Vineyards & Winery, along with homemade holiday hors d’ oeuvres. Dec. 11 and 12 from 12 noon to 6 p.m. 5768 Church Rd., (336) 264-7731. Saxapahaw Artists Co-op is having an art show with sales of works by local artists at the Co-op Gallery, located next to the Saxapahaw Post Office. Justin Johnson, award-winning local jazz and blues guitarist, will be performing on Saturday. He will be playing originals from his recently released album “Stream of Blues,” as well as Christmas arrangements from his brand new Christmas album, “Justin Time for Christmas.” You can check out his music at www.JustinJohnsonLive.com. 1610 Jordan Drive, Saxapahaw NC 27340. The gallery will be open on Saturday Dec 11 from 12- 8 PM and on Sunday from 12- 7PM. Contact Suzanne Connors (336) 693-4606 for more information. Saxapahaw Rivermill will feature a Showroom Open House of the new Rivermill Lofts and Marketplace (next to Rivermill Salon) and mill tours, on Dec. 11 from 2-6 p.m.
Saxapahaw United Methodist Church Open House Sunday Dec 12 from 2:00-5:00 with Music, hot cider, and cookies, followed by the Annual Christmas Family Night Program from 5:00-7:00 pm with children’s skits, music, soups and sandwich dinner. Non-perishable food and toy donations for the local “Food Pantries” and “Toys for Tots” are welcome. 5624 Church Road. (336) 376-3630. Victory Calls Stables will have an Open House. Location: 3316 Sax Beth Church Road. For more information and times, call 336-376-8505; or see www.victorycallsriding.com. From Chapel Hill/Carrboro take HWY 54 West, approximately 13 miles. Turn left on Saxapahaw-Bethlehem Church Road. From Hillsborough, take Orange Grove Road to HWY 54 W to Sax-Beth Church Road. From Mebane, take Mebane-Oaks Road to HWY 54, travel across to Sax-Beth Church Road. From Burlington, take I-40 to exit 147 toward Pittsboro approximately 10 miles. Turn Left onto Church Road.